The Clark County Wetlands Park in Las Vegas provides lush habitats for hundreds of animal and plant species while also improving the quality of the area’s water supply. The park offers award-winning programs to teach youth and adults about the wildlife and ecology of the Las Vegas Wash through engaging, interactive programs that promote a sense of place and a connection to nature. Offerings for adults, families, children, students and teachers include guided discovery walks, family programs, events, art, recreation programs, and opportunities to be involved in meaningful stewardship projects. Building a nature center and exhibit hall on this land would prove both rewarding and challenging. After all, each aesthetic aspect of these buildings would need to reflect the serenity and commitment to ecology of the park as a whole. One of the considerations for construction was the requirement to place an exit stairway on the side of the building. Being a means of egress, this stairway had to meet the code specifications of the National Fire Protection Association (NFPA) for a minimum light level along it. This meant that the exit path had to a have a minimum light-level of 10 foot-candles along the walking surface. Traditionally, when faced with a situation such as this, the designers would revert to the standard solution of a pole or wall mounted floodlight. However, in this application, it was agreed that this would negatively affect the aesthetics of this architecturally stunning building. Light projected by the units would extend far beyond the walking surfaced, resulting in unattractive lighting. The visual “noise” from the inclusion of fixtures or poles in this natural landscape would be overbearing. The solution to avoiding these results was to use Milwaukee-based The Wagner Companies‘ Lumenrail LED illuminated handrails for the stairway. By including the light source in the already required railing, no additional architectural elements needed to be introduced. From a cost standpoint, Lumenrail provided two opportunities for cost reduction. 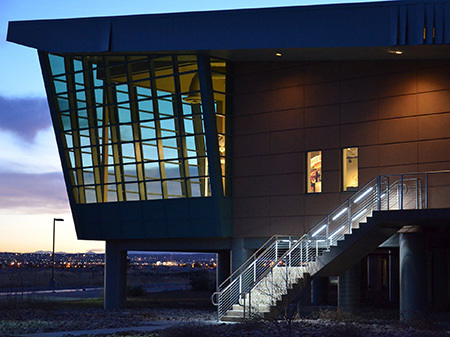 First, by only lighting the required surfaces, the nature center enjoys a consistently reduced demand for energy consumption, saving money and resources. Secondly, by avoiding the need for light poles and flood lights, the expense of the light poles, concrete bases, flood lights and wire trenching were likewise eliminated. Wagner’s Lumenrail illuminated handrail system uses solid state LED technology to achieve excellent lighting performance in a minimal form factor. Illuminated handrail is the perfect platform to deliver primary or supplemental lighting to a space, often eliminating the need for ancillary luminaires. Lumenrail is stocked in color temps from 3000 degrees to 5000 degrees Kelvin, with custom colors as options. The light engine for Lumenrail is a high-performance modular LED light stick with standard, mid- and high-output offerings. Specified with clear or matte lensing, and symmetric or asymmetric distribution options, the Lumenrail provides a solution for most applications.